Anker’s SoundCore blew away the competition to take the title of your favorite affordable Bluetooth speaker, and today you can pick one up for $29, the best price we’ve seen since Black Friday. In addition to solid sound quality and impressive Bluetooth range, the standout feature here is the SoundCore’s 24-hour battery life. I’ve owned one for over a year now, and while I’ll occasionally remember to plug it in when I pass by a spare micro-USB cord, it’s never once given me a low battery warning, and I use it a lot. If you travel with any regularity, the HooToo TripMate Titan may just be your new best friend, because it’s actually three devices in one. File hub: Transfer files and wirelessly stream content from a hard drive or flash drive to all of your devices. Imagine loading a cheap thumb drive up with movies for a long trip, instead of, say, buying an expensive iPad with more local storage. Today on Amazon, you can knock about $9 off the price of the TripMate with promo code A7EKH25E. We aren’t sure how many they have in stock, or how long the promo code will last, so I’d act fast if you’re interested. Just in time for May the 4th, you can plan your own aerial assault with these discounted Star Wars screen prints from Inked And Screened. Today only, choose between the blueprints of a TIE Bomber or an infographic of the Death Star, for about $20. Now if only Jyn Erso had known that she could just buy the plans from Amazon. I bought the FitDesk 2.0 on a whim a couple of years ago and was surprised both by how viable it was to work at and how compact it gets when folded up. It fits easily into a closet or opens up for use while working, gaming, or marathoning Netflix, and is particularly nice out on the balcony. Today’s price is the best we’ve seen, and it doesn’t go on sale often. A giant inflatable pool swan might be the silliest deal we’ve ever posted, but hey, it’s never been cheaper. Just don’t end up like Johnny Football. You’ve probably been running outside for a few weeks now, but if you were looking for an excuse to pick up new running shoes, here it is. Amazon is marking down four styles (two men’s and two women’s) of Saucony running shoes to under $60. But you’d better pick up the pace, because these prices only last for today. I want this complete The Office box set so badly. If I start watching it, I’ll go all night long. The show always left me satisfied and smiling. Just note that it’s a DVD, not a Blu-ray [sarcastic look at the camera]. 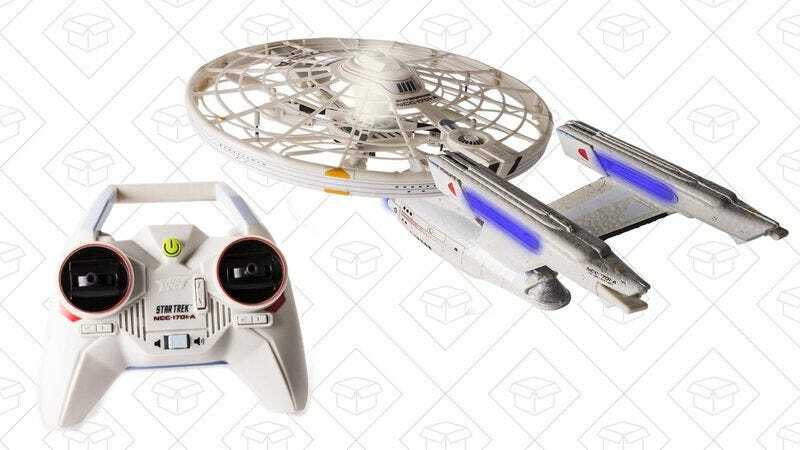 Air Hogs’ Starship Enterprise drone would be the ultimate gift for the Star Trek fan in your life, so go to warp factor 8 and get over to Amazon while it’s just $30, easily an all-time low.